What Is The Best Electric Toothbrush? The Top 5 Reviewed. Brushing your teeth is important. It prevents bad breath and keeps your mouth healthy. But what you might not know is that some studies have suggested that certain diseases are associated with the health status of your mouth. So again, brushing is important! And while you’re at it, you might as well do a great job. A number of innovative new electric toothbrushes were introduced in the last year and we will review those toothbrushes that excel, so you can pick the best electric toothbrush. 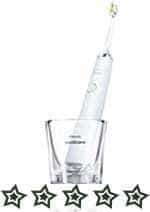 The Philips Sonicare DiamondClean stands outs. With a hidden illuminated display, ceramic finish, travel case with USB charger and a “regular” glass charger, nothing was left untouched to make this the most beautifully designed electric toothbrush. “Nice, but does it brush my teeth?”. Yes! And it does a good job too. With Philips Sonic Cleaning action, diamond-shaped bristles and 5 cleaning modes, the DiamondClean removes plaque up to 7x more effective and whitens your teeth twice as much as a manual brush. This is a beauty and a beast in one! The Oral-B Professional Care SmartSeries 5000 is a great designed electric toothbrush that seems quite expensive for a toothbrush but is actually friendly priced for what you get. 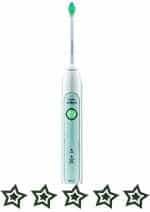 The brush has oscillating, rotating and pulsating movements in order to clear plaque. It has multiple modes for different cleaning purposes, such as Daily Cleaning, Whitening, and Deep Clean. The Smart Series comes with a great wireless Smart Guide that helps you to brush perfectly. It gives intelligent signals to the user when to change quadrant when to much pressure is applied and much more. This is an intelligent electric toothbrush! Read our full review of the Oral-B Professional Care Smart Series 5000. The Philips Sonicare Flexcare Platinum is a sonic electric toothbrush that leaves the user with a fresh, white smile every time. Consumer testing was very positive. 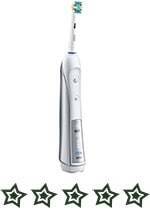 The Flexcare Platinum has 3 different brushing modes: Clean, White and Gum Care. Combined with 3 sensitivity levels (low, medium and high), it has a total of 9 cleaning modes. With a brush that has bristles that were specially designed, the Flexcare Platinum removes 7x more plaque than manual brushes. To prevent damage to the gums and teeth the Flexcare has a pressure sensor, which alerts the user when too much pressure is applied by gently vibrating the handle. With its built-in timer, you know when to switch quadrants and when you are finished. Although a bit pricier than the number two, this is an excellent toothbrush! 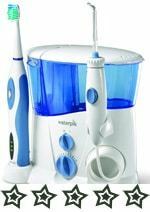 The Waterpik WP-900 is a complete oral care system that has a water flosser and sonic toothbrush, which is 70% more effective in clearing plaque, and keeping your gums healthy compared to brushing with a sonic toothbrush alone. The water flosser has a large water reservoir and a pause button on the handle, so you have full control. It has 2 cleaning modes and 2 timers: a quadrant pacer and a 2-minute timer. The sonic brush is shipped with 2 heads (a small and medium one) and a travel case. Altogether this is a great oral complete care set! 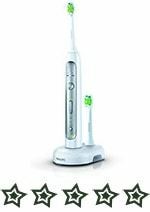 The Philips Sonicare HX6711 is sonic toothbrush that is not super high-end but is a great pick for a (bit) smaller budget. The HX6711 has 2 cleaning modes: Clean and Clean & White. The first for your everyday cleaning and the latter for additional whitening, as you may have guessed. This brush can get your teeth up to 2 shades whiter than brushing with a manual brush. It has 2 timers to instruct the user what to do. One signals you to change the quadrant of your mouth, the second timer signals the end of your 2-minute cleaning session. It does not come with pressure control, but this reflects in the price, as it is cheaper than the other models. Altogether, the Philips Sonicare HX6711 is a great high-end toothbrush for a decent price.